Goodreads: A man in a business suit offers the protection of his umbrella to an unsuspecting woman ... and several days later she turns up dead on a river bank, raped and strangled. The terrifying serial killer known in the press as the Rainy Day Killer is now hunting new victims in the city of Glendale ... whenever it rains. Homicide Lieutenant Hank Donaghue leads the investigation as the killer begins to communicate directly to him through phone calls and grisly packages containing body parts of his victims. Assisted by FBI profiler Ed Griffin, Donaghue and Detective Karen Stainer pursue an elusive predator who leaves no physical evidence behind. The timing couldn't be worse, however, as Karen Stainer's attention is divided between the investigation and preparations for her upcoming wedding. Distracted and uncertain about her future, Stainer is furious when she learns that the Rainy Day Killer has followed her to Virginia, where the wedding will take place, and that he intends to make her his next victim! Kritters Thoughts: A serial killer enjoys the wet weather and is able to take his victims in broad daylight and keeps them captive for four days while they endure the most horrific demise, sounds like a great who dun it to me! Set in a town close to where I live, this police force must use everything they have to catch this killer, especially when he decides to target one of their own while she is trying to get married. My one issue with this book was there were a few parts that were beyond predictable. The two times the killer was very present, were overly obvious to the reader while the police detectives were clueless, I wish they had had a little more inkly earlier on as to when the killer was "seen." Although beyond this point, I loved the whole search for this killer and enjoyed when he contacted the police force; it made the hunt exceptionally interesting. I may have lost some sleep the night I was reading this one because the things this killer did were so gruesome, thankfully it wasn't raining! Disclosure of Material Connection: I received one copy of this book free of charge from Tribute books. I was not required to write a positive review in exchange for receipt of the book; rather, the opinions expressed in this review are my own. 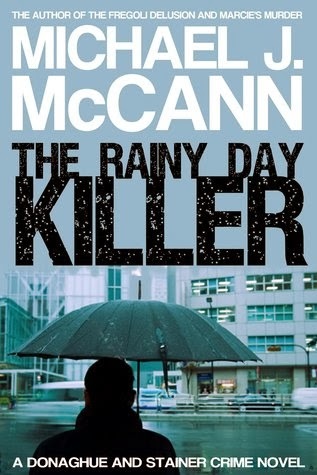 Thanks very much for participating in the blog tour and reviewing The Rainy Day Killer. Kristin, I'm glad Michael's thriller kept you up at night ... in a good way! Thanks for the review. The Husband's Secret is soooo good!